Opportunity's Pancam took the component images between the 2,811th Martian day, or sol, of the rover's Mars surface mission (Dec. 21, 2011) and Sol 2,947 (May 8, 2012). Opportunity spent those months on a northward sloped outcrop, "Greeley Haven," which angled the rover's solar panels toward the sun low in the northern sky during southern hemisphere winter. The outcrop's informal name is a tribute to Ronald Greeley (1939-2011), who was a member of the mission team and who taught generations of planetary scientists at Arizona State University, Tempe. The site is near the northern tip of the "Cape York" segment of the western rim of Endeavour Crater. North is at the center of the image. South is at both ends. On the far left at the horizon is "Rich Morris Hill." That outcrop on Cape York was informally named in memory of John R. "Rich" Morris (1973-2011), an aerospace engineer and musician who was a Mars rover team member and mission manager at NASA's Jet Propulsion Laboratory, Pasadena. Bright wind-blown deposits on the left are banked up against the Greeley Haven outcrop. 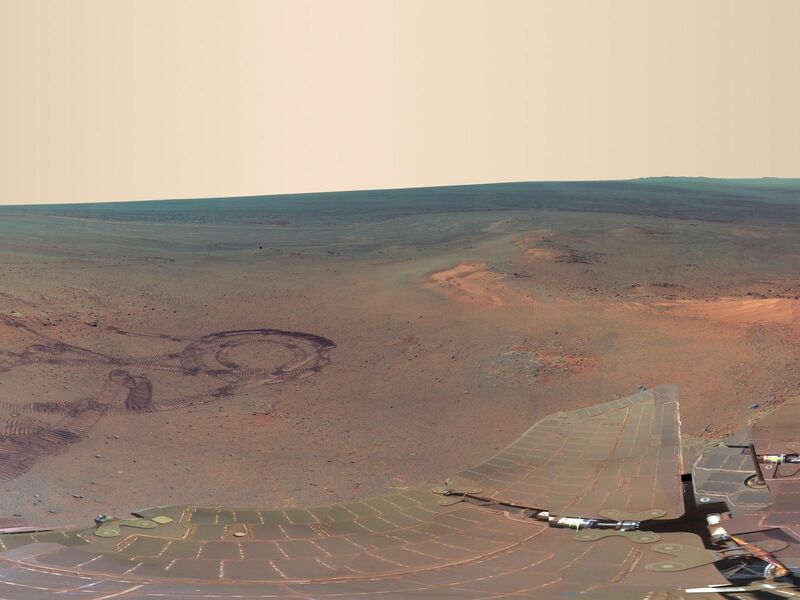 Opportunity's tracks can be seen extending from the south, with a turn-in-place and other maneuvers evident from activities to position the rover at Greeley Haven. The tracks in some locations have exposed darker underlying soils by disturbing a thin, bright dust cover. Other bright, dusty deposits can be seen to the north, northeast, and east of Greeley Haven. The deposit at the center of the image, due north from the rover's winter location, is a dusty patch called "North Pole." 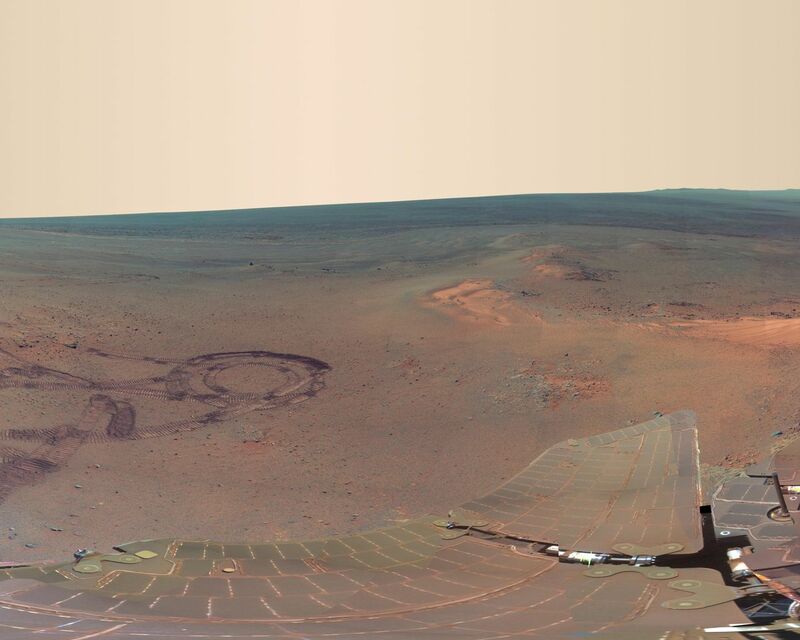 Opportunity drove to it and investigated it in May 2012 as an example of wind-blown Martian dust. The interior of Endeavour Crater can been seen just below the horizon in the right half of the scene, to the northeast and east of Cape York. The crater spans 14 miles (22 kilometers) in diameter. Opportunity's solar panels and other structures show dust that has accumulated over the lifetime of the mission. 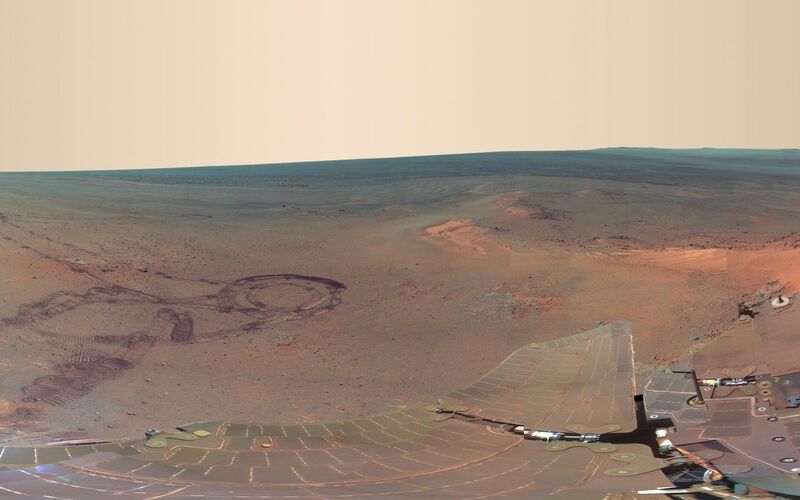 Opportunity has been working on Mars since January 2004. During the recent four months that Opportunity worked at Greeley Haven, activities included radio-science observations to better understand Martian spin axis dynamics and thus interior structure, investigations of the composition and textures of an outcrop exposing an impact-jumbled rock formation on the crater rim, monitoring the atmosphere and surface for changes, and acquisition of this full-color mosaic of the surroundings. The panorama combines exposures taken through Pancam filters centered on wavelengths of 753 nanometers (near infrared), 535 nanometers (green) and 432 nanometers (violet). The view is presented in false color to make some differences between materials easier to see. Photojournal Note: Also available are: PIA15869.tif (Full-Res TIFF) and PIA15869.jpg (Full-Res JPEG) These files may be too large to view from a browser; they can be downloaded onto your desktop by right-clicking on the previous links and viewed with image viewing software.